This is the third and final part of my series of whether to foul when the game is tied and the shot clock is off. If you missed part 1 and part 2, don’t worry, you’re joining us just in time. The payoff was this guide to when the strategy of fouling is justified. 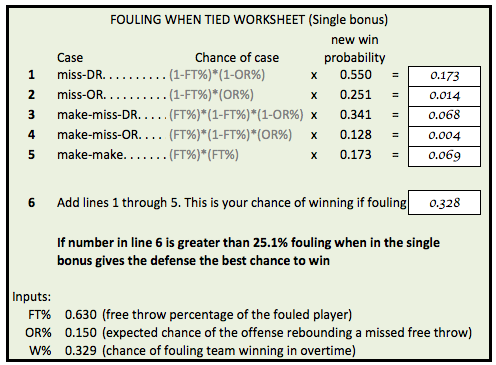 For example, if we estimated that a team had a 40% chance of beating its opponent before the game started, that team would be justified in fouling a free throw shooter worse than 74.4% if the opponent was in the single bonus and 62.0% if they were in the double bonus. If you’re interested in the methodology that produced the figures in the chart, you’ll have to read parts 1 and 2. My apologies in advance. Obviously, we shouldn’t treat these numbers as gospel. There are assumptions involved in these calculations and those can affect the final numbers. But I think these are solid ballpark figures from which to make a decision, and the decision to is more beneficial—and less disputable—for underdogs. In part 1, I promised to show that Jim Valvano’s decision to foul Alvin Franklin was not only justified but appropriate, and through the chart we can see that it was. Brent Musburger helpfully notes after the game that the Wolfpack were an eight-point underdog, which would put them at about a 20% chance of winning (or a 32.9% chance of winning in overtime). Franklin was a 63% free throw shooter which is well below the listed threshold of 82.4%. Here’s how the fouling worksheet looks using this figure and Franklin’s season-long shooting percentage. So State’s chance of winning was increased from 25 percent to 33 percent by using this strategy. It’s hard to imagine another single strategic decision that could affect a team’s chances so dramatically. However, there is little interest in pursuing such a strategy in 2014. Two contemporary examples that illustrate this point occurred on the same night last season. According to FanMatch, both Auburn and Boston College were given a four percent chance of beating their respective opponents on February 19, Florida and Syracuse. Both underdogs faced the last-possession situation described here. Based on my win probability model, teams with a four percent chance of winning have about a 16 percent chance of winning in an overtime scenario. Let’s say my model was missing some information—betting markets were slightly more bullish on each underdog’s chance of winning—and each team actually had a 25 percent chance in overtime. In this case, playing straight-up defense on the final possession would give each squad just a 20 percent chance of winning (because the possibility of overtime is so large and the chance of winning in overtime is so bleak). Therefore, the FT% shooting threshold for fouling goes up significantly. In a single bonus situation, fouling anyone that was worse than a 87.7% shooter would improve the team’s win chances. Both the Eagles and Tigers were in the double-bonus situation, but that case was viable, too, requiring fouling a shooter worse than 83.4% to improve the win probability. In BC’s situation they could have fouled Tyler Ennis, a 75% shooter, and improved their chances of winning from 20.6% to 23.3% using my calculations. BC played straight up D, survived to see overtime, and eventually handed Syracuse its first loss of the year in one of the season’s most unlikely outcomes. Auburn, on the other hand, accidentally fouled its way into a great situation when Asauhn Dixon-Tatum hugged Patric Young after an Auburn missed free throw. Given that Young was a 57% free throw shooter for his career, there may not have been a foul all season that improved a team’s chances more than this one. According to the math, sending Young to the line and reducing the possibility of overtime bumped Auburn’s chances of winning to 28.9 percent from the 20.6 percent they would have faced by playing defense. It’s the kind of improvement that doesn’t occur in even the most cherry-picked of fouling-up-three scenarios. But we’re a long way from 1983, and Dixon-Tatum’s happy accident was strongly criticized by the SEC Network’s on-air crew and at least one national writer. And this reaction is always going to be a factor to a coach that considers fouling. Despite the fact that this strategy can provide a large benefit to a team trying to pull off an upset, that team will still lose most of the time when fouling. And the losing coach will have employed an unconventional strategy which will get criticized in a way that playing straight up defense will not. So we’re only likely to see this strategy implemented by a coach who isn’t concerned about his reputation. However, it’s a strategy that can be useful, especially for underdogs who figure to struggle in five more minutes of action.